Discussion ebbs and flows on the topic of U.S. spending. Of particular interest to several of my liberal friends is military spending. 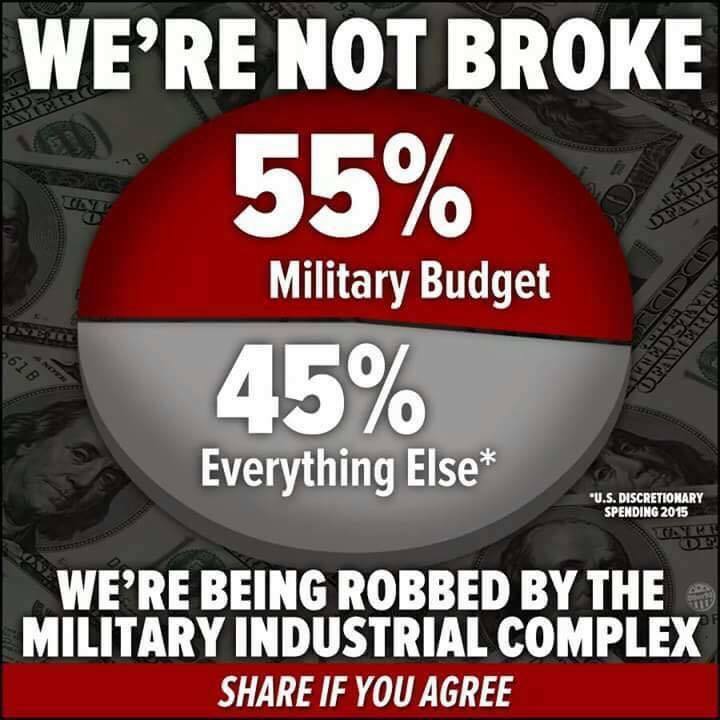 Frequent Facebook posts on this subject claim that military spending consumes over half the budget. I agree that the military is not an ideal place to invest so many billions of dollars. I also agree that the U.S. has a history of blowing money on weapons and aggression. Further, I question whether the U.S. uses military means when a better, longer-lasting path to peace and stability in troubled parts of the world would be investments in education, infrastructure, agriculture, and commercial development. All that said, I have to protest the continuing use of incorrect data in arguing against military spending. The cause for less military spending is not enhanced by presenting incorrect information. Just the opposite. 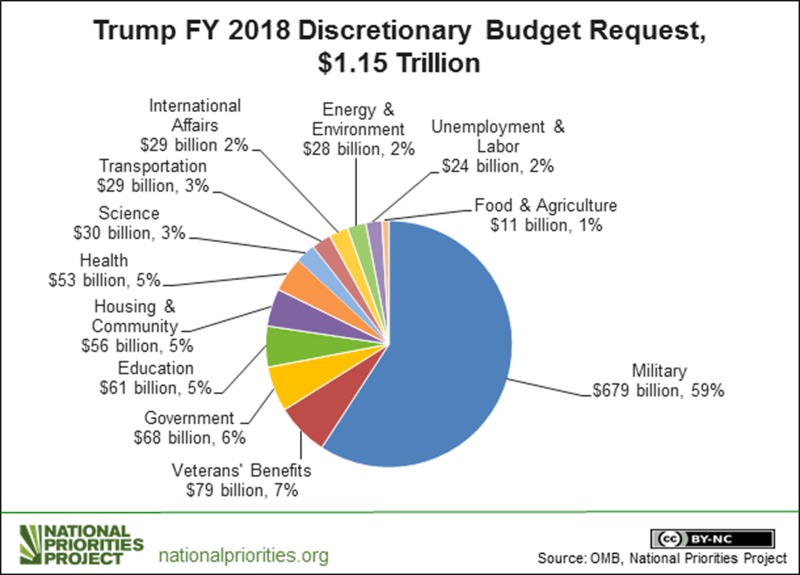 Please note that the portion designated military spending occurs in the lower left of this pie chart and as such does not constitute half of the U.S. budget. It’s important to discriminate between a breakdown of discretionary spending and overall spending. Discretionary spending is one category of overall spending. 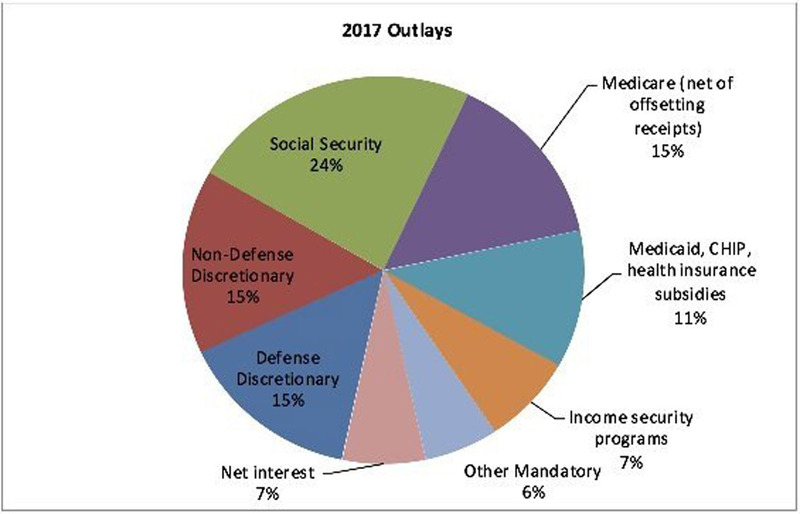 It’s within the slice of pie of discretionary spending where we see the big bite that goes to the military: So yes, military spending within its slice of pie of discretionary spending, is over half the budget. And there’s no limit to the close examination this distribution of funds deserves. But please, let’s make our arguments based on the actual facts. * A common perception about Social Security benefits is: I am entitled to the money. It’s my money. I’ve saved it. * Social Security is mainly a “pay-as-you-go” program. This means that it pays most of its benefits by taxing people who are currently working. * Per the Social Security Administration: The money you pay in taxes is not held in a personal account for you to use when you get benefits. Your taxes are being used right now to pay people who now are getting benefits. Any unused money goes to the Social Security trust funds, not a personal account with your name on it. 94% of all Social Security payroll taxes were spent in the same year they were collected. 13% of Social Security’s total income (including payroll taxes, taxes on Social Security benefits, transfers from the general fund of the Treasury, and interest on the Social Security Trust Fund) has accumulated in the Social Security Trust Fund. * Per the Social Security Administration: Since the Social Security system has not accumulated assets equal to the liability of promised future benefits, the social security wealth that individuals hold represents a claim against the earnings of future generations rather than a claim against existing real assets. * After the federal government pays back with interest all of the money it has borrowed from Social Security, the program’s current claim against the earnings of future generations is $30.8 trillion. This amounts to an average of $132,914 for every person now receiving Social Security benefits or paying Social Security payroll taxes. So let’s get our heads screwed on straight, fellow progressives. While a large chunk of U.S. tax dollars go to military expenditures, it is NOT consuming over half of our tax dollars. Our Social Security and Medicare funds are NOT held for our future use like individual savings accounts, but rather are spent immediately in payouts to persons currently receiving Social Security and Medicare benefits. If we expect to prevail in directing our nation toward a more equitable and socially conscientious future, we need to be well informed and make our arguments for social justice in ways that make sense and align with the facts. This entry was posted in American Culture, current events, Economics, government and tagged deficit, federal budget, federal spending, medicare, military spending, retirement, retirement age, social security, tax dollars, taxes on February 11, 2018 by Denele Campbell. What about all the money the government has “borrowed” from Social Security for purposes other than what it was collected from the taxpayer for? I have heard that if those monies were repaid, Social Security would not be in as bad a shape. My understanding of the Social Security laws is that it was expected from the beginning that the government could/would ‘borrow’ from the fund. The borrowed amount gains interest until repaid. So I don’t believe this figures into the Social Security shortage. The problem is that the program was designed so that current SS withholding is what pays for current SS recipients. It’s not like a savings account where what you put in is what you get out. If it worked that way, many current recipients would already have used up what they put in. As the larger Baby Boom generation ages, more people will be drawing SS funds. Meanwhile, the younger generation whose withholding actually funds those payments is not as many people and therefore they are putting less money into the SS account than is needed to pay the older folks. The options are limited as to how to solve this problem, some of which are already in effect like a later retirement age before benefits can be claimed. Another is high withholding amounts for the younger folks who are actively contributing to the fund through their payroll taxes. Yet another, least favorable option is to reduce SS benefits paid to retirees. I find it strange because I work for the IRS and how someone who under goes an audit and found to have owed money is hit with so many penalty fee’s on top of the interest. Whether it was done intentionally or not if amount was discovered after 10 years each year the penalty fee which can be as high as the tax itself is included with tax owed and charged interest for each year. Whether it can be waivered or not this amounts to usery which I thought was against the law. Government departments have always had allocation determined by money spent year before. Unless of course a reccession or depression hits and cuts are made mandatory. 780 billion allocated for military out of 1.3 trillion still falls between 55-60%. 2017 chart is when sequester was still in place which cuts straight across the board and military was hit hardest because it spends the most. Afraid your arguement doesn’t hold water. Sorry but your comment doesn’t make sense.